Institutional Review Blog: After Human Terrain, Will AAA Debate IRBs? After Human Terrain, Will AAA Debate IRBs? Earlier this month, the American Anthropological Association's Commission on the Engagement of Anthropology with the US Security and Intelligence Communities (CEAUSSIC) issued its Final Report on The Army's Human Terrain System Proof of Concept Program. Alternatively, the report hints that the real problem is merely a poor choice of words. "We should consider the work of HTTs to be sharply different, in its goals, from conventional disciplinary ethnographic pursuits and not to be 'ethnography' in any credible sense." (54) If HTS were re-branded to avoid the terms "anthropology," "ethnography," and "social science," and instead present itself as a counterinsurgency program pure and simple, then--it seems--CEAUSSIC would not expect it to follow either the AAA ethics codes or the Common Rule. All of this points to the need for clear definitions when discussing ethical and legal obligations. For the purposes of this blog, a more interesting document is the October 13 blog post, "Why not Mandate Ethics Education for Professional Training of Anthropologists?" by CEAUSSIC member Carolyn Fluehr-Lobban. A future standard ethics curriculum would minimally include a history of the discipline and ethics– this would help to correct misconstruing history, as has been the case in security engagement polemics where a standard of "voluntary informed consent" is often cited as 'traditional' or normative when, in fact, language on informed consent appears for the first time in the 1998 AAA code. It would also include case studies representing a realistic spectrum of scenarios and dilemmas where mixed outcomes are the likely norm, and clear positive or negative outcomes are likely exceptions. There is still a tradition of resistance to the annoyance of having to go before an IRB. Part of this history rests with anthropology as the study of "the other," of "subjects," using "informants," whereby the anthropologist is ideally unfettered with unlimited freedom to conduct research. But, clearly, this is not the world we live in. As standard practice, all anthropological research is, or should be, subject to external review. In other words, Fluehr-Lobban suggests that anyone who doesn't like IRBs wants unlimited freedom to study "the other." This is an insult to the many thoughtful critics who, over the decades, have shown that IRBs and their attendant apparatus can be a barrier to true ethical reflection. It is also an indicator of how entrenched the belief in IRBs has become within the AAA leadership. But has the organization ever really debated whether IRBs are the best way to promote its ethical standards? If not, CEAUSSIC should seize this opportunity for such a discussion within the profession. HTS trainees do undergo ethical training. HTS also has an ethical guideline document. There are reviews of case studies and of projects, and further, more strenuous review is underway. HTS Social scientists who are behavioral scientists have already undergone IRB training as per their own professions and all social scientists adhere to the ethical guidelines of their professions, not just what HTS has in place. There are informed consent protocols that are in place and used with each person interviewed. Therefore, HTS does participate in as strenuous, if not more strenuous training than most anthropology students undergo in their education and most professionals undergo at university. If you read the IRB you will see that HTS is exempt; but even if HTS registered and made every social scientist take the certification courses, the AAA would still have issue with them. The AAA did not do their due diligence in their research on HTS and wrote a highly biased report that only references the works of members on the CEAUSSIC board. How is THAT ethical? It is certainly not impartial. Furthermore, they use the works of "indy-bloggers" and "indy-media" as their source for factual material. The AAA has gotten caught up in a poor educational exercise, bad media, and misinformation. This in many ways may be HTS's fault for not responding to many of the comments about them as they should, however, for a proof of concept program that is bound to have growing pains, how often should we expect some commentary? As a taxpayer, if the govt. is dead-set on having this program to see it to fruition for usefulness, I want program managers to focus on missions, training, and effectiveness than responding to a group of disgruntled anthropologists who have no interest in listening to their side anyways. I think the AAA needs to focus on something- anything to help revive the field and right now, HTS is it. They used to be against "applied anthropology" in any form, and were having issues with forensic anthropology because they don't get informed consent from family members before working a forensic case. The AAA had issues with forensic anthropologists working in Bosnia, Serbia, Croatia, Guatemala, and Iraq on mass graves work even though the international community was clamoring for it. Had the physical anthropological community paid much attention to the AAA, war crimes in those countries would not have been prosecuted unless it was by military personnel with little to no forensic training; which then would have led to faulty cases and criminals getting away with murder. In a nutshell; how much attention should the profession as a whole pay to the AAA board right now? Are they really in touch with the actuality of the field itself, and are they truly able to speak for the professionals who are out there working anthropological jobs every day? I'm curious how you reached the conclusion that HTS is exempt from IRB requirements. In October 2007, Col. Steve Fondacaro argued for an exemption based on 32 CFR 219.101(b)(2). Since that exemption only applies to research whose disclosure cannot reasonably place subjects at risk, and since the Army has conceded that HTS gathers information that could make informants the targets of violence (CEAUSSIC report, p. 32), I don't think that argument holds water. Another possibility is 32 CFR 219.101(c), which states that "Department or agency heads retain final judgment as to whether a particular activity is covered by this policy." Thus, the secretary of the army could simply pronounce HTS off limits to IRBs. But so far as I know, he has not done so. Indeed, Army lawyers could only tell CEAUSSIC that they were "reviewing this matter." (CEAUSSIC report, p. 49), the same response that Thomas Strong received two years earlier. I agree with your broader point that, over the decades, the AAA's ethics codes have been drafted by and for academic anthropologists, with little consideration for the challenges faced by applied anthropologists. CEAUSSIC chair Robert Albro recognized this problem in his September 2009 Anthropology News essay, "Ethics and Dual-Identity Professionals." 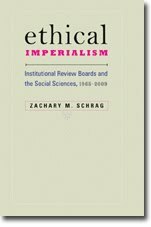 He writes, "at present our ethics conversation has not balanced the patrolling of our disciplinary boundaries with the varieties of ethical and legal requirements within which extra-academic anthropologists now routinely work." Whether the AAA will fix that is another story. It is inaccurate and ungenerous to claim that the report "only references the works of members on the CEAUSSIC board." If there are available sources on HTS overlooked by the Commission, I'd appreciate a list. Is Documentary Film Human Subjects Research?